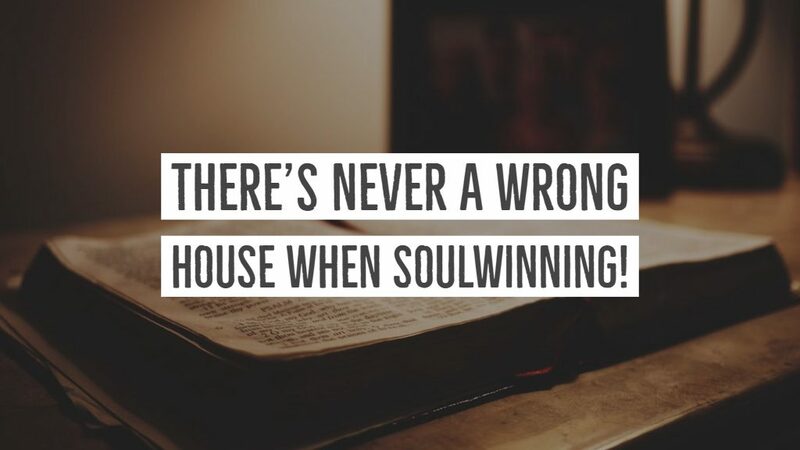 There's Never A Wrong House When Soulwinning! I was visiting a Mrs. Turner on Indiana Street. Now, Indiana Street is only one block from Truman Street. Since the words “Turner” and “Truman” are a lot alike, I accidentally went to Truman Street instead of Indiana Street. I came to the right number, however, knocked on the door, and asked if Mrs. Turner were in. She said, “No, this is Truman Street,” and then I realized that I had the right number but the wrong street. I turned to walk away when suddenly the Holy Spirit prompted me to witness to Mrs. McDowell. A few days ago I was in Texas and saw one of my converts, a Mrs. Tillett, whom I won to Christ years ago after finding I had the wrong house. I had knocked on the door and asked for a certain lady. “She lives a few houses down,” answered the lady at this house. “But are you a Christian?” I asked Mrs. Tillett. She began to weep, and in a few moments, I led her to Christ. One of the ladies saved at the wrong house is still a faithful attendee of the services at the First Baptist Church of Hammond.